With NFL Week 10 kicking off tonight, here’s a stats-driven preview of three of this week’s biggest games. Want access to all our premium NFL predictions, tools, and data this season? Check out our NFL betting picks, NFL pick’em pool picks and NFL survivor pool picks. You can also read an overview of our premium content for football. This week’s Thursday night game is perhaps the best game of the week, featuring two teams on winning streaks with playoff aspirations. Carolina’s offense has been on fire over the last two weeks, scoring 36 points against the vaunted Baltimore defense and 42 points vs. Tampa Bay. Headed by second-year RB Christian McCaffrey, the Panthers lead the league with 5.2 yards per carry. The usually inaccurate QB Cam Newton is also showing more accuracy this season in new offensive coordinator Norv Turner’s short passing game, as the Panthers rank eighth in completing 67.4% of their passes. The Panthers are the seventh most run-heavy team in the NFL (44.6% run play rate), but opposing teams have passed a lot more often than run against the Steelers defense this season; the Steelers have faced the second highest rate of pass plays in the league. The maligned Pittsburgh secondary did start to get on track in Week 5 after a streak of terrible showings vs. Kansas City, Tampa Bay, and Baltimore, and has held every quarterback it’s faced in its current four-game winning streak to well under 300 yards passing. Turner may stick to the Panthers usual run-heavy game plan as a result. The Steelers continue to make do without holdout star RB Le’Veon Bell, though it’s worth noting the offense has the fifth highest pass play split in the NFL. QB Ben Roethlisberger is on pace to easily set a career high in pass attempts, and is coming off his busiest game of the year, throwing 47 times against Baltimore. Teams have generally tried to pass on Carolina’s defense, throwing the ball nearly 65% of the time against them. Aside from DE Mario Addison, the Panthers have had trouble getting to the quarterback and could have a bigger problem this week against the Steelers, whose defense yields the second lowest quarterback sack percentage in the league. While the Panthers are holding teams to only 6.7 yards per pass, that’s unlikely stop Pittsburgh from continuing its pass-heavy ways. Head to Head: Pittsburgh has won the last five matchups, dating back to 1999. The most recent matchup was a 37-19 win by the Steelers in 2014. The Saints are riding high after a huge win against the previously unbeaten Rams, effectively putting them atop the NFC at 7-1. New Orleans has now won seven consecutive games after losing to the Bucs in Week 1, but face a challenge at Cincinnati. Currently ranking second in the league with 34.9 points per game, the Saints offense has shown unmatched efficiency, completing an incredible 76.2% of its passes. QB Drew Brees has also thrown just one interception to this point, and his quick release along with the strong play of the offensive line has led to just a 3.1% sack rate against the Saints, third best in the league. While they’ve only averaged 3.9 yards per rush, the Saints have also been a run-heavy team with 28.6 rush attempts per game (sixth most). They face a Bengals defense that has allowed yards galore this year, ranking dead last in yards allowed per game (447.8), third worst in rushing yards per attempt (4.9), and seventh worst in passing yards per attempt (7.5). For the Cincinnati offense, this could be a situation where they just need to keep up, given the inconsistent play of the defense. The Bengals are already starting off with a handicap, as star WR A.J. Green is set to miss Sunday’s game with a toe injury. QB Andy Dalton is now without Green and TE Tyler Eifert, but he does still have two potent weapons in RB Joe Mixon and WR Tyler Boyd. Mixon is averaging 4.8 yards per carry and 84.8 rushing yards per game, while Boyd is already having a career year through eight games with 620 yards receiving. Boyd will likely be the focus of the Saints defense due to the absence of Green, but should also have his fair share of opportunities vs. a defensive unit that’s allowing 8.5 yards per pass attempt, second worst in the NFL. Head to Head: The Bengals have won four of the last five matchups, dating back to 1996. The Bengals won the last game 27-10 at New Orleans in 2014. When it rains, it pours for the Cowboys. They suffered a tough home loss to Tennessee on Monday, and now have to visit the rival Eagles on a short week. This may well be a do-or-die game for the 3-5 Cowboys’ playoff chances. The team’s problems on offense aren’t a mystery, with Dallas averaging just 6.3 yards per pass attempt and 188.4 passing yards per game. Jerry Jones tried to address the issue two weeks ago by trading a first-round pick for WR Amari Cooper, and he helped with five receptions for 58 yards and a score in his first contest as a Cowboy. Teams have generally attacked the Eagles defense via the pass this year, averaging 40.0 passes per game, so it will be interesting to see if that trend continues. RB Ezekiel Elliott has been one of the few bright spots for the Cowboys offense, helping the team average 4.8 yards per carry and rushing for 680 yards through eight games. Philadelphia has had an up and down start to the year as they try to defend their Super Bowl title. The Eagles were only 4-4 entering their bye week and have yet to win back-to-back games. They’ve also lost consecutive home games, albeit against tough opponents in Minnesota and Carolina and by a combined six points. 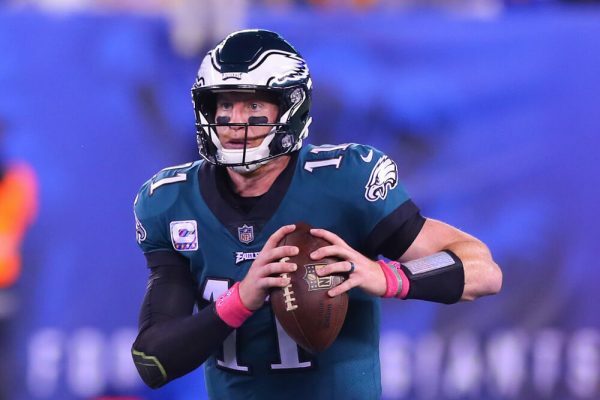 Philly’s lack of a running game has become an issue in closing out games (especially with the season-ending injury to RB Jay Ajayi), and the team has gone to a committee approach. The Eagles rank only 22nd overall with 4.1 yards per carry, though rookie RB Josh Adams did give the team life with nine carries for 61 yards in their last game vs. Jacksonville. This game could be an opportunity for the Eagles to test the run again, as Cowboys LB Sean Lee is out yet again with a hamstring injury. QB Carson Wentz also got a new option during the bye week when the Eagles acquired WR Golden Tate from Detroit. Wentz has been ultra-efficient since returning in Week 3, completing 70.7% of his passes with 13 touchdowns vs. two interceptions. The Cowboys have rushed the passer well this year (8.42% sack rate), but teams are completing more than 69% percent of their passes against Dallas, fifth worst in the NFL. Head to Head: Dallas won the most recent matchup 6-0 in Week 17 of last season, ending a streak of two straight wins by the Eagles. Enjoy NFL Week 10, and if you’re in an NFL pool or planning on betting some of the Week 10 games, please check out our premium products: NFL Survivor Picks, Football Pick’em Pool Picks, and NFL Betting Picks.